Hello all. After a little over a year from the time the Vatican asked the Philippine Church to look into the situation of the 2 CFCs, with the desire to become one once again, Cardinal Rosales called the first meeting with the 2 CFCs (we only had one one-to-one meeting before). Present were Cardinal Rosales, Bp Gabby Reyes, Bp Jesse Mercado (incoming head of the Episcopal Commission on the Laity), Msgr Allen Aganon (missionary priest for 5 years in Peru), Fr Greg Gaston (former secretary to Cardinal Trujillo in the Pontifical Council for the Family), Joe Tale, Rouquel Ponte, Joey Arguelles (for CFC Global), Lachie Agana, Gary Faustino, Chito Liban and myself (for CFC-FFL). Joe Yamamoto of CFC Global failed to show up. Both CFCs were cordial to each other. (1) Division is a scandal. Jesus prayed for unity. The conflict has spread worldwide, with some bishops abroad asking him about it. (2) We should not look back. We should not look at who is at fault. (3) Spoke about ecclesial movements, quoting from the book of Cardinal Ratzinger "New Outpourings of the Spirit." He stressed that the ecclesial movements should "submit to the demands of the whole in order to be true to their own nature." (4) Spoke of the importance of Spiritual Directors. They should not only be asked to celebrate Masses and the like. But a true Spiritual Director gives guidance, is actively involved in the life of the community, is prophetic, censures and corrects, is an active part of the community. Then Cardinal Rosales assigned Spiritual Directors -- Msgr Allen to CFC Global, and Fr Greg to CFC-FFL. Both CFCs accepted. Joe Tale said they recently had 3 bishops as Spiritual Directors (Bp Villena for Luzon, Bp Medroso for Visayas, Bp Pacana for Mindanao) and were going to ask for a priest who could become a more involved Spiritual Director. I said that from the split we had Bp Reyes as Spiritual Director. Then he assigned Fr Francis Gustilo as Asst Spiritual Director, who has been very intimately involved with us, such as overseeing our monthly teaching, giving Bible studies, doing the annual 4-day retreat for the BoC, etc., aside from being my personal Spiritual Director. Fr Arlo Yap, SVD, is Spiritual Director for SFL, is very involved and knows many of the leaders, and has now been assigned by the SVD to CFC-FFL up to 2011. Cardinal Rosales says the current Spiritual Directors can be retained. The new ones are in addition. I suppose their particular task is oriented towards the ultimate goal of the Vatican to reunite the two CFCs. Cardinal Rosales said he is very happy and he can now report to Cardinal Rylko of the Vatican. Bp Reyes brought up the issue of the unpaid retirement benefits of the brethren who resigned from CFC Global. Joe Tale said it was already approved and first payment (it is on installment) is tomorrow. (1) This again is another proof that the Vatican recognizes both CFC Global and CFC-FFL as CFC, but would really want them to become one. (2) Now I hope the process of moving toward truth and justice can start. At the very least, if we have serious concerns about the conduct of CFC Global, we can go to their Spiritual Director, who is tasked to really look into their community life. Thank you for all your prayers. Let us continue to pray for God's will to be done. On behalf of the chapter, I would like to thank all of you again for your assistance last Saturday as we kicked off the program in Bliss floodway. May God’s grace continue to make us worthy instruments of His love to our bretheren in the area. This morning, we had the initial sessions of our engagement at the Bliss Village , Floodway, Pasig . 25 members aside from the service team attended the initial sessions. The sessions today were community organizing and livelihood orientation. Sessions on Livelihood Values Education will follow. The village,with its adjacent poor neighborhoods, is a mission area of our chapter at St.Jude Thaddeus Parish, Pasig . Having assessed that their poor members in the area needs help in the form of livelihood funding assistance, their chapter leadership has initiated to raise funds for this purpose. Fund raising started by requesting for cash donations instead of gifts in a birthday party celebration. At the moment, they have some P46k as initial fund and may increase since their other leaders are doing the same in their birthdays. The idea is to give funding to individual or group livelihood projects that will be screened as feasible by their team. This is of course after the organization & guidelines are set up.The funding should be repaid by the borrower( with a minimal interest?) to allow other members access to funding. Making this a cooperative is part of the plan. We are in the process of organizing them into a Mission Village with focus first on community life & livelihood components. The May They Be One (MTBO) Bible campaign, jointly spearheaded by the Episcopal Commission on the Biblical Apostolate of the Catholic Bishops’ Conference of the Philippines (ECBA-CBCP) and the Philippine Bible Society (PBS), continues to gain ground following yet another successful Bible distribution. In an effort to realize a vision of a transformed Philippines by making available five million copies of the Bible affordable to the poorest Catholic homes all over the country, the ECBA-CBCP and the PBS partnered with the Couples for Christ-Foundation for Family and Life (CFC-FFL) to distribute copies of the MTBO Bible at the Mother of Mercy Restoration Village in Sitio Bayan-bayanan, Barangay San Vicente, San Pedro, Laguna. Bro. Isaias “Bonjie” Bonjibod, who is the fulltime Pastoral worker of CFC-FFL’s Work With the Poor (WWP) Ministry, said the Bible distribution was but one aspect of their efforts to restore the lives of their Restoration Village (RV) beneficiaries. “As we address their physical needs, like a roof over their heads, we must also not neglect their spiritual needs,” he pointed out. As part of their values formation program, RV beneficiaries take part in a nine-session Christian Life Seminar (CLS). Upon graduating, they receive a copy of the Bible as part of the organization’s Donate-a-Bible campaign, Bro. Bonjie explained. “After graduation and receiving their Bibles, our restoration teams continue meeting them on a weekly basis through what we call ‘Bible sharing sessions,’ where their understanding of the God’s Word is deepened” he said. The Mother of Mercy Restoration Village is a 6,800-square-meter plot of land that will house 120 families from various informal settler communities in the town of San Pedro. The CFC-FFL local restoration team, led by Bro. Larry Tuason, is also assisted by the nuns from the Sisters of Virgin Mary Immaculate in taking care of the new community. The beneficiaries were very grateful, not only for the free housing, but more importantly, for the direction and guidance that the Bible provides. One CLS facilitator also shared that before the end of the last formation seminar, the participants repeatedly expressed their relief, delight, joy and a renewed sense of being. “Seeing their reaction when they come to know the Lord fills my heart with joy,” she said. Lloyd Umbina, an RV beneficiary and a recent CLS graduate, shared that he considers knowing the Lord such a blessing, but not without its share of trials and tests. A construction worker by trade, this father of seven shared that he once almost met an accident at work that could have ended his life. He considers it a miracle that he was able to leave his work area before a corrugated sheet that was above it came crashing down. Another time, he was beset with fever for three days, one of which was the very day of their scheduled baptism. Despite feeling weak, he trudged on to church to join the others and was baptized that day. “Working with Couples for Christ and knowing God through His Word has impacted my life in a very huge way. It has led me to always do what is right and pleasing to God. It has also encouraged me to hear Mass more regularly,” he said. While this Bible distribution was the first partnership between ECBA, PBS and CFC-FFL, it was not the first involvement of the Catholic lay organization in this Bible campaign. With members based in different parts of the globe, CFC-FFL in Eastern Europe was also instrumental in helping the Bible Society of Slovenia raise nearly PhP 200,000 which subsidized the printing of 2,000 copies of the May They Be One Bible. This partnership is expected to continue as both organizations continue to plan to line up more Bible distributions in communities under the CFC-FFL WWP Ministry. Under the five-year program, copies of the Bible are made available to poor families at an affordable price of PhP 50. This is the Philippine Church’s response to the 12th Ordinary Synod of Bishops held in Rome last year calling for a deeper Bible engagement for all Catholics. As of July 10, 2009, over 78,000 copies of the MTBO Bible have been distributed in 93 communities all over the country, including CFC-FFL Mission Villages in Pandi, Bulacan and Muntinlupa City. Matapos ang mahigit ng tatlumpung taong pananahimik, mayroong ilang nasa kapangyarihan na pinagpipilitang buhayin ang matagal ng patay—ang Bataan nuclear power plant. Ang bagong dahilan daw kung bakit dapat buksan ang nuclear power plant ay upang maging mas mura ang kuryente at upang labanan ang global warming na dulot ng paggamit ng langis. Ang usapin tungkol sa nuclear power ay usaping sangkot ang moralidad. Kami po na inyong mga pastol ay nagnanais na magbigay ng ilang gabay panuntunan upang makita natin ang moralidad o imoralidad ng nuclear power plant sa Bataan. Hindi po ito tungkol sa politika o negosyo. Nakasalalay ang buhay ng tao. May usaping moral na dapat nating harapin. Huwag sana tayong magmadali na gumawa ng isang mahalagang pasya. Kung may gumugulo sa ating isip, makabubuting ipagpaliban ang pagpapasya. Pag-isipang mabuti at pag-aralan. Huwag basta maniwala sa sinasabi ng mga propaganda. Mag-aral. Makinig. Manalangin. MAPANGANIB ANG NUCLEAR POWER PLANT. Bakit mapanganib ito? Toxic materials ang ginagamit sa nuclear power plant. Ang uranium at plutonium ay mga toxic minerals. Sa paglipas ng mga taon, alam na natin na ang leukemia sa mga bata ay isa sa mga masamang bunga ng radiation. Ang mga minero ng plutonium at uranium ay mga lihim na biktima na ng toxic minerals na ginagamit sa nuclear power plant. Nakamamatay. Nakapagdudulot ng sakit kahit walang tagas ng nuclear plant. Maaaring magka aksidenteng dulot na pagkakamali ng tao. Tandaan natin ang Three Mile Island sa Pennsylvania at ang Chernobyl. Libu libong tao ang naging biktima ng pagkakamali ng tao sa pagpapatakbo ng nuclear plant. Hanggang ngayon ay nagdurusa pa rin ang mga biktima ng aksidente se nuclear power plant ng Three Mile Islang at Chernobyl. Maaaring magka aksidente dahil sa hagupit ng kalikasan. Ang nuclear power plant ng Bataan ay nakatayo malapit sa dalawang bulkan—ang Mount Pinatubo at Mount Natib. Ang sabi ng propaganda ng nuclear power plant ay mayroong automatic shutdown ang planta kung may baha o lindol, Subalit ang naging karanasan ng mga nuclear power plant na nasa tabi ng dagat o kaya ay malapit sa bulkan ay hindi ganito. Maikli ang panahon kapag lindol ang yumanig sa nuclear plant at hindi agad gumagana ang automatic shutdown. May problema kung saan dadalhin ang nuclear waste na tiyak na toxic material at mapanganib. Kahit ang Francia at America ay hindi malaman kung ano ang gagawin sa nuclear waste. Kahit ibaon sa lupa, alan natin na maaaring gumalaw ang lupa at sumingaw ang nuclear waste. Ang toxic nuclear waste ay mapanganib sa kalusugan kahit daan daang taon na ang nakalipas. Cancer at mga abnormality ng mga sanggol ang pangunahing dulot nito. Maaaring maging target ng terorista. Ang mga suicide terrorists ay ituturing na magandang target ang nuclear plant sapagkat maraming maaaring masaktan o mamatay. Sa pamamagitan ng sasakyang pandagat, panlupa o panghimpapawid, ang nuclear ppwer plant ay magandang target ng terorista. TANDAAN SANA NATIN—LUBHANG MAPANGANIB ANG NUCLEAR POWER PLANT SA BATAAN. Kung susukatin natin ang magandang bunga at panganib na dulot, lubhang mabigat ang panganib na hatid. Huwag nating ipagwalang walang bahala ang buhay, kalusugan at kaligtasan ng ating lalawigan hindi lamang ngayon kundi sa mga susunod pa sa atin. Labag sa moralidad ang nuclear power plant sa Bataan. Kayo po ay inaanyayahang dumalo sa isang prayer rally upang masugpo ang pagbubukas ng nuclear power plant sa Bataan. Ang rally ay gaganapin sa harap ng Katedral ng San Jose sa Balanga sa ikadawalampu at tatlo ng Pebrero, araw ng Lunes, simula ikaapat ng hapon. Kung kayo ay may malasakit sa bayan, dumalo po kayo at manindigan. Kailangan nating lubos na harapin at pag-aralan ang lahat ng sangkap na sangkot sa pagbubukas ng nuclear power plant. Ang bansa ay naghahanap ng mura at ligtas na kuryente para sa kapakanan ng taumbayan. Maganda at mabuti ang layuning ito.Hindi sapat na mura, higit sa lahat dapat ay ligtas. Madalas ay hindi na naisasaalang-alang ang bunga nito sa mga tao. May karapatan ang taumbayan na malaman ang lahat ng bagay tungkol sa nuclear power plant. Ang panukalang batas na nasa Kongreso ay may pamagat na House Bill Mandating the immediate re-commissioning and commercial operation of the Bataan Nuclear Power Plant. Ang ating panawagan ay huwag magmadali. Ang lumalakad ng matulin, kung matinik ay malalim. Ang pasya ay nasa Maynila nasa Bataan naman ang pinsala. Pansinin natin ang mga bagay na ito. Una, ang Bataan nuclear power plant ay sampung kilometro lamang mula sa bunganga ng Bulkan Natib. Walang sinuman sa mga iginagalang na geologists ang nagsabi na ligtas ng Napot point kung saan nakatayo ang nuclear plant. Wika ni Dr. Ronnie Torres, ngayon ay nasa University of Hawaii, noong 1992 “Natib volcano does not erupt very often but could still erupt. As a rough rule of thumb, the longer a volcano is in repose, the more time it has to store eruptive energy”. Ang ating panawagan sa ating mga kongresista ay makinig sa saliksik ng mga siyentipiko.Ang mga pamaraan ng kalikasan ay hindi mababago upang itugma lamang sa ninanais ng congressman. Ikalawa, wala tayong uranium sa Pilipinas. Kapag binuksan ang nuclear power plant, aangkat tayo ng uranium mula sa ibang bansa kung paanong umaangkat tayo ng petrolyo sa ibang bansa. Malaking gastusin ang bumili ng uranium sa ibang bansa. Hindi ito pagbuti ng kabuhayan sapagkat mananatili tayong umaasa sa ibang bansa. Ikatlo, ayon sa propaganda ng nuclear power plant, ang kuryenteng galing dito ay walang carbon dioxide na nagdudulot ng global warming. Subalit ang ginagamit sa pagmimina, paglilinis at pag-aayos ng uranium ay fossil fuel pa rin hanggang makarating ito sa nuclear reactor. Samakatuwid, mayroon pa ring carbon dioxide na ibinubuga. Hindi naman talaga gayon kalinis ang nuclear ppwer plant. Ikaapat, ang nuclear power plant ay nagbubuga ng toxins na nakapipinsala sa tao, hayop at halaman. Sino ang sasagot sa pagpapagamot ng mga tao at hayop na magkakasakit dahil sa nuclear plant? Ang lahat ng pinagmumulan ng kuryente ay may pinsalang dulot sa tao. Piliiin natin ang may pinakamaliit na pinsala. Ikalima, ang nuclear power plant at binayaran ng buwis mula sa taumbayan. Ang bayad ay $2.3 billion dollars para sa planta at $460 million dollars para sa interest ng utang. Wala tayong napakinabang. Ngayon ay nais na gastusan ng $1 billion dollars upang makumpuni! Ayon sa ilang nakaaalam na tao, beinte porsiento ng budget ng pamahalaan ay nawawala at napupunta sa graft and corruption. At kung aabutin ng sampung taon upang makumpuni ang nuclear plant, ilang tao kaya ang yayaman dahil sa proyektong ito? Ilabas natin ang katotohanan tungkol sa nuclear power plant. Hindi naman yata ito malinis na pagnanais na makatulong. Mayroon na namang nais yumanan kahit mahirapan sa kababayad ang taumbayan sa utang na hindi naman pinakinabangan. HINDI TAYO ANG MAKIKINABANG SA NUCLEAR POWER PLANT. Alamin ang totoo. Manindigan laban sa nuclear power plant. BA ANG SAGOT SA ATING PROBLEMA? Ang naririnig nating propaganda ng nuclear power plant ay “Iligtas ang Inang Kalikasan!” Iwasan ng fossil fuel. Huwag daw tayong gumamit ng petroloyo, ng gas o ng carbon upang magkaroon ng kuryente sapagkat ang mga ito ay nakapagpapa init sa ating mundo. Ang sagot daw ay nuclear power plant. Mayroon pa bang iba pang paraan upang magkaroon ng kuryente na matipid bayaran at ligtas sa taumbayan? Paano natin malulutas ang pandaigdigang energy crisis? Ang unang sagot ay pagtitipid at wastong paggamit ng kuryente. Ayon sa pag-aaral, 25% ng ating ginagamit na kuryente ay aksaya lamang. Halimbawa ay ang incandescent bulb na ginagamit sa ilang tahanan. Ang incandescent bulb ay mas maaksaya kaysa sa fluorescent bulbs. Harapin natin ang energy crisis sa pamamagitan ng masusing paggamit ng kuryente. Nakasaksak ang plug kahit hindi ginagamit. May ilaw ang kuwarto kahit walang tao. Kailangang palamigin ng aircon ang isang malawak na lugar kahit kakaunti lamang ang tao. Ang pagtitipid sa kuryente ay hindi nakapagdudulot ng leukemia o birth deformity. Mabuti para sa kalikasan. Mabuti para sa bulsa. Maraming geothermal sources dito sa Pilipinas. Ayon sa pag-aaral, ang gastos sa drilling ng geothermal wells ay nababawi ng negosyante sa loob ng sampung taon. Ang geothermal ay ligtas. Ang drilling na ginagamit sa langis at gas ay maaaring gamitin sa geothermal. Walang ibinubugang toxins. Hindi rin magiging target ng terorista sapagkat nasa ilalim ng lupa. Araw at gabi ay maaaring gamitin ang geothermal power hindi tulad ng solar o wind energy. Sa ating panahon, anumang pinagmumulan ng kuryente na walang canrbon dioxide ay itunuturing nating mabuti. Dahil sa pamahalaan at sa ilang negosyante, maganda ang propaganda para sa nuclear power. Subalit ang mga tanong ay wala pa ring tiyak na sagot: Ligtas ba ang tao sa toxic materials? Tiyak bang hindi magkakamali ang taong bantay sa nuclear plant? Tiyak bang hindi puputok ang Bulkang Natib? Tiyak bang hindi magkakalindol sa Morong? Alam na nila kung saan itatago ang toxic nuclear waste? Ang paggamit ng nuclear power upang gumawa ng kuryente ay mapanganib, magastos, nakakatakot at hindi naman kailangan. Ang paggamit ng nuclear power sa ibang bansa ay naging tukso pa upang maglunsad ng nuclear arms ang maraming bansa. Ang nuclear power plant ay banta sa kapayapaan ng mundo. Ito ay panganib sa buhay ng tao. Hindi nuclear power ang sagot sa ating krisis sa mundo. Dagdag na problema ito sa ating marami ng problema. Graft and corruption is systemic and structural. It is not only individual or isolated persons who corrupt and get corrupted. The present system the elected and the electors, the employers and the employees, the appointed and the appointing powers has become so corrupt that what we do need is a radical, systemic, interior change. Changing personages through the electoral process or even through legal processes like impeachment and court suits will not necessarily result in reform unless there is a willingness to change from the heart and soul. Pinning our hopes on legal processes unaccompanied by conversion from within will lead us to nowhere but deeper frustrations. We can hear the protest “Tama na. Sobra na. Alis na. Kami naman!”. It is important that those who investigate or prosecute corrupt officials will not gain political or financial benefits from convicting or absolving the accused. The public money that goes to graft is money stolen from the poor. Because of graft and corruption, schools buildings cannot be constructed and teachers are not paid; public hospitals cannot protect us from untimely death; soldiers are deprived of their just wages. 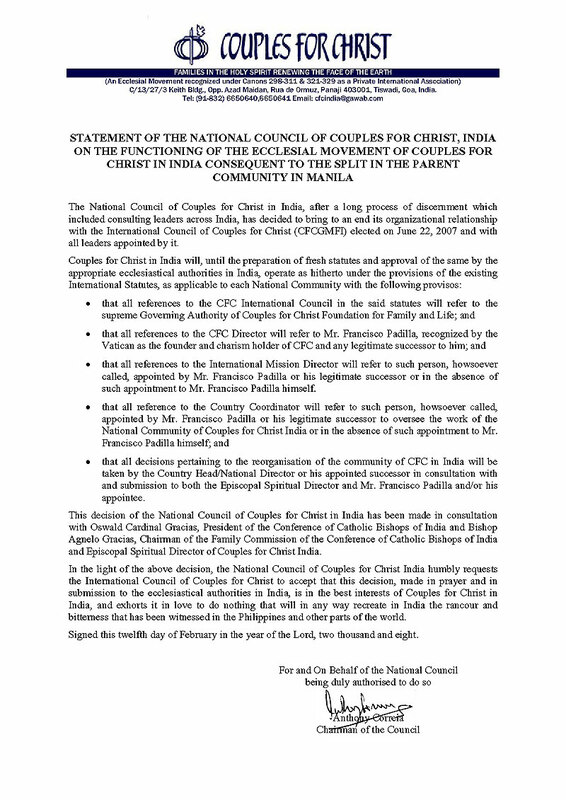 After months of introspection and circumspection, carried out in a spirit of deep and fervent prayer, discernment and widespread consultation, Couples for Christ - India, the largest CFC community of locals outside of the Philippines, has taken a stand on the present situation that has gripped the world-wide CFC community. Displayed below is the Statement of its National Council. "Kana si Father Tulabing sige gyud na siya�g panaot sa Couples for Christ� Kana si Fr. Tulabing sige dyud niya�g tirahan ang Couples for Christ�� This kind of comment is surely missing the point. The past seven weeks when I tackled the Couples For Christ issue in Negros Chronicle and in my homilies, I showed how I love Couples For Christ. I would not even bother to clarify matters about the CFC split issue if I don�t have great love for Couples for Christ. For the record, I can claim that I am partly instrumental of CFC�s acceptance by priests and its spread here in Negros Oriental and Siquijor which comprise the Diocese of Dumaguete. When Couples for Christ first started in 1989 here in the Diocese of Dumaguete, many priests did not like it for various reasons. I managed to convince the priests to give CFC a chance to grow and prove its worth. Then some errors were corrected, there were adjustments made, and eventually Couples for Christ spread very fast in the whole Diocese. So how can some leaders and members of couples for Christ Global GK say with all honesty that I am trying to destroy Couples for Christ? Most of their leaders and members know very well how I supported them and how I helped to make them grow since their trying years in the early 90�s. But now that they consider me �not serving the interest of Couples for Christ-GK�, they try to poison the minds of their members about my purported �panaot� of Couples For Christ. And by the way, the Church is not expected to serve the interest of Couples for Christ. It should be the other way around: Couples for Christ should serve the interests of the Church. My intention really is to save Couples for Christ from utter destruction at the hands of the enemy. As priest and pastor, I should help RESTORE Couples For Christ to its original charism, vision, and mission. I am aware of my power to do it. With the little power I have, God will multiply the little that I have. Dili puede nga dili ra tagdon sa pari kini nga issue. Dili puede nga pasagdan ra� ni sa pari. Asa man diay paingon ang CFC? Don�t you think priests have the duty to guide CFC members to proper loyalties, faithfulness, and obedience to our bishops? Don�t you think priests have the right and the duty to lead and guide Couples For Christ members in the right direction? I for myself am trying to guide and re-direct CFC to its original charism, vision, and mission where they can be very helpful in the mission and vision of the Church. Priests need to exercise authority over Couples For Christ in their parishes, after all it is within the realm of the priests� duties to govern. And members of Couples for Christs should allow themselves to be governed. Priests have to guide and insist that the members of CFC should remain faithful and loyal not only to proper Church authorities but to CFC�s original purpose and charism which is Family Evangelization, Family Spirituality and Family Renewal. The members of couples for Christ must be faithful to God first and foremost. Again, Gawad-Kalinga is good. We have nothing against it except for the donations that they still receive from Pharmaceuticals manufacturing and distributing contraceptives. The Church still considers contraceptives anti-life, and Couples For Christ is supposed to be Pro-life. The point is that there have been directives and guidelines, there have been dialogues and meetings to reconcile and check the errors, but the International Council of Couples For Christ-GK insisted on their mistakes, refused to be corrected, and to amend, and even maligned the bishops working very hard on the win-win solutions to their problems. All the members of CFC must be made aware of the existing problems within CFC. Magpakabana gyud unta ang tanang members, and the local CFC leaders should not hide the truth from their members. All the members of Couples For Christ must help REFORM and RESTORE CFC to its original vision, mission, charism, and purpose. Unsa man mong klase sa pagka-miembro sa CFC if you don�t help in the RESTORATION of CFC? Take that as a challenge. Ang pagsupak ug wala pagtahod sa mga direktiba sa Roma ug sa mga local bishops dako kaayong kalapasan nga gihimo sa Couples For Christ � International Council. Dili puede nga konsentihon kini sa mga members sa CFC. Apil ang tanang miembro sa CFC sa kaulawan nga gihimo sa ilang International Council, mao nga dili puede nga ang mga miembro dili manginlabot. The members should even protest about what their International Council is doing (disobeying the bishops) and help in the RESTORATION of Couples for Christ to its original charism. Couples for Christ is Couples for Christ. Gawad-Kalinga is Gawad-Kalinga. Gawad-Kalinga is not Couples for Christ, and Couples for Christ should not be Gawad-Kalinga. If only the CFC-Global Mission Foundation Incorporated heeded the spiritual advice of Bishop Socrates Villegas who is one of CFC’s spiritual guides, then possibly the Couples for Christ would have not been separated into two these days. Of course there’s nothing wrong with Gawad-Kalinga. It is a very noble Social Apostolate for the poor. But fusing Gawad-Kalinga with Couples for Christ, or vice versa, has caused many troubles which eventually resulted to two Couples for Christ. There are now two Couples for Christ because of the very noble cause of Couples for Christ Foundation for Family and Life to RESTORE CFC to its original vision-mission which is Family Evangelization, Family Spirituality, and Family Renewal. Couples for Christ cannot and should not put all its efforts to Gawad-Kalinga, otherwise it overemphasizes social apostolate to the detriment of Family Evangelization which should be the main concern of CFC. 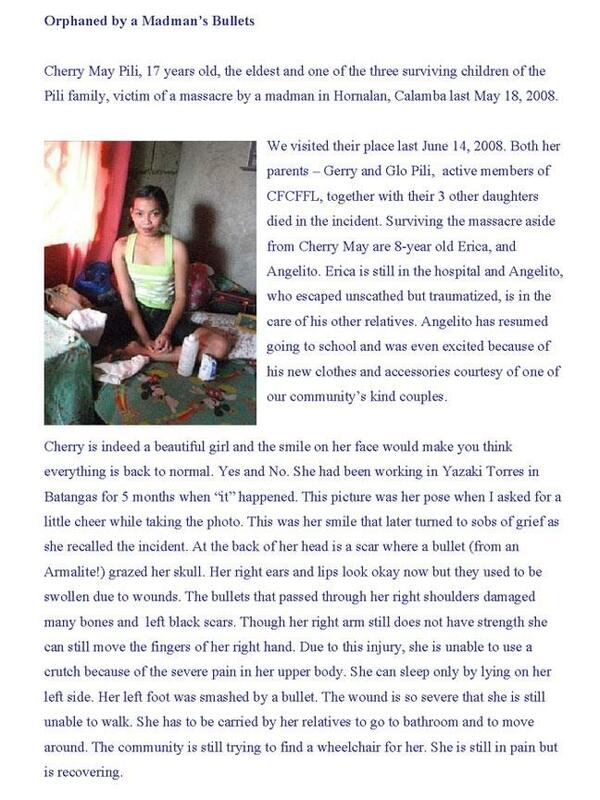 In fusing CFC and Gawad-Kalinga, there is always that tendency to over-stress one while undermining the other. And that’s what actually happened. In the case of CFC-GK, Gawad-Kalinga has been over-emphasized, putting aside Family Evangelization, Spirituality, and Renewal. Of course the CFC-IC (International Council) would not admit this but these have been the observations of many members of Couples for Christ themselves, leading to many complaints raised by many of the members of Couples for Christ who were engaged in the Gawad-Kalinga programs. So, as recommended by Bishop Socrates Villegas, Couples for Christ need not engage in Gawad-Kalinga anymore, just as Gawad Kalinga should concentrate on GK and leave Couples for Christ to do what it is expected to do- the renewal of the family which is one of the nine (9) pastoral priorities of the Church in the Philippines . If possible, Gawad-Kalinga should refrain from using the name Couples for Christ to avoid confusion, and members of Couples for Christ should instead go back and focus on CFC’s original purpose. “You cannot serve both God and money… you will either love one and despise the other”… It is Tony Meloto himself who declared and was quoted many times as saying that if members of Couples for Christ do not support and work for Gawad Kalinga then they should look for another community. Well, the members of CFC-Foundation for Family and Life did just what Tony Meloto recommended, giving birth to another child of Couples for Christ which is now CFC-FFL (Couples for Christ Foundation for Family and Life). This is indeed a very noble task which the reluctant founder of Couples for Christ Frank Padilla started with the honest intentions of RESTORING Couples for Christ to its original meaning and purpose. I believe it is just a matter of delicadeza that Gawad-Kalinga not use the name Couples for Christ anymore, concentrate on its Social Apostolate, and leave CFC in peace. CFC-FFL has all the rights to use the name Couples for Christ because Frank Padilla is its founder and FFL is consistent with the vision-mission of the true and genuine Couples for Christ which has never veered away from its original purpose while remaining faithful and loyal to the Catholic Church authorities whose recognition of Couples for Christ is still much needed. In other words, Gawad-Kalinga is by itself a very successful mission among the poorest of the poor (I would like to believe so) and it should not use anymore Couples for Christ and the Church at large to advance its own objectives. The members of the Couples for Christ should listen and follow their original, though reluctant founder, Frank Padilla, who remains faithful to the original vision of Couples for Christ. The members should likewise listen to the directives of the Catholic Church Hierarchy. 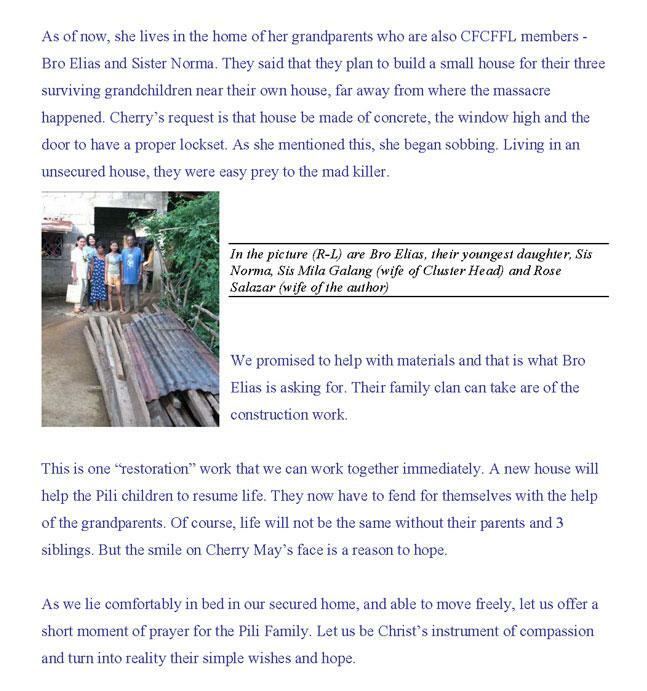 That is why CFC-FFL is now giving itself a very good name and they are now in very good standing in the Church. The Catholic Church and our society in general need people who will work for the renewal of the family. Thanks to CFCFFL. Hello all. The Holy Father's reflections on the Year of St Paul has some valuable insights for our own situation of crisis in CFC. Some fault us for "breaking away" and not working things out within CFC. We did try, but the other side did not engage in dialogue. We did try to restore from within, but the other side intensified its attacks. Ultimately they "kicked us out." Like Paul, we could not look to superficial harmony. We could not sacrifice the truth of veering away. Our motivation has always been our fidelity to Christ and to his call to us. Because of our conviction, we suffered -- maligning, untruths, oppression, persecution, deprivation of what is rightfully ours. But even this confirms our call. We suffer for the authentic gospel. "In a world where lies are so powerful, truth is paid with suffering." But even as we have a right and just cause, we look to reconciliation and eventual unity. We do not malign in turn. We do not spread lies. We have no blogspots or anonymous emailers dedicated to attacks. We absorb unjust attacks and deprivation in humility. We do not do to them what they do to us. We do not spend millions in members' tithes for ads, travels and hakot. We do not burn bridges. We want to overcome the division. We look to creative unity now (one family with two distinct branches) and look to actual unity perhaps later. Continue to pray for those who are blind, lost and in darkness. VATICAN CITY, 28 JUN 2008 (VIS) - At 6 p.m. today in the basilica of St. Paul's Outside-the-Walls, Benedict XVI presided at the celebration of first Vespers for the Solemnity of Sts. Peter and Paul Apostles, which also marked the opening of the Pauline Year. Among those participating in the ceremony were the Ecumenical Patriarch Bartholomew I and representatives from other Churches and Christian communities. The Holy Father, Bartholomew I, delegates from other Christian confessions, and monks from the abbey of St. Paul's Outside-the-Walls walked in procession to the portico of the basilica where, before the statue of the saint, the Pope lit a candle from a brazier which will remain burning for the entire Pauline year. After the Pope the ecumenical patriarch and the representative of the primate of the Anglican communion also lit candles. The procession then entered the basilica through the Pauline Door. "We are gathered around the tomb of St. Paul, who was born 2000 years ago in Tarsus in Cilicia, in modern-day Turkey", said the Pope in his homily. "For us, Paul is not a figure of the past whom we recall with veneration. He is also our master, the Apostle and announcer of Jesus Christ to us too. Hence we are gathered here not to reflect upon a past history which has been left irrevocably behind. Paul wishes to speak to us today". Thus, the Pope explained, the Pauline Year serves "to listen to him and to learn from him, as from a master, the faith and the truth in which the reasons for the unity of Christ's disciples are rooted". "It is of great joy to me", said the Holy Father, "that the opening of the Pauline year should have a particularly ecumenical character, thanks to the presence of many delegates and representatives of Churches and ecclesial communities, whom I welcome with all my heart". They include "the Patriarch Bartholomew I, ... fraternal delegates of Churches that have especially close ties to the Apostle Paul (Jerusalem, Antioch, Cyprus, Greece) and that form the geographical setting of the Apostle's life before his arrival in Rome, ... and brethren from various Churches and ecclesial communities of East and West". "We are gathered here to ask ourselves about the great Apostle of the Gentiles. We ask ourselves not just who Paul was, but above all who he is. ... His faith was the experience of being loved by Jesus Christ with an entirely personal love; it was an awareness of the fact that Christ faced death not for some unidentified cause, but for love of him - of Paul - and that, being Risen, He loves him still. Christ gave Himself for him. ... His faith was not a theory, an opinion on God and on the world, His faith was the impact of God's love on his heart. And so this faith was love for Jesus Christ". The Holy Father then recalled how many people see Paul as "combative" noting that, "in fact, there was no lack of disputes on the Apostle's path. He did not seek superficial harmony. ... The truth was too great for him to be disposed to sacrifice it in the name of exterior success. The truth he experienced in his encounter with the Risen One was, for him, well worth struggle, persecution and suffering. But his deepest motivations were the fact that he was loved by Jesus Christ and his desire to transmit this love to others. ... Only on this basis can the fundamental concepts of his message be understood". Focusing then on one of Paul's "keywords: freedom", the Pope explained that "Paul, as a man loved by God, was free. ... This love was the 'law' of his life and, thus, it was the freedom of his life". Paul "spoke and acted moved by the responsibility of love. Freedom and responsibility are inseparably united. ... Those who love Christ as Paul loved Him can truly do as they please, because their love is united to the will of Christ and thus to the will of God; because their will is anchored in truth and because their will is not simply their own will - the decisions of an autonomous 'I' - but is integrated into the freedom of God". The Pope then went on to consider Paul's conversion on the road to Damascus, when the Risen Christ proclaimed "I am Jesus Whom you are persecuting". By "persecuting the Church", said Benedict XVI, "Paul was persecuting Jesus" Who "identifies Himself with the Church as one single subject". This exclamation which transformed Saul's life "contains the entire doctrine of the Church as the Body of Christ. Christ has not withdrawn to heaven, leaving a group of followers on earth to pursue 'His cause'. the Church is not an association that seeks to promote a particular cause" but "the person of Jesus Christ Who, even when Risen remained as 'flesh'. ... He has a body. He is personally present in His Church". "Through all this we glimpse the Eucharistic mystery, in which Christ continually gives His Body and makes us His Body", said the Pope and, noting with regret the laceration of this Body, asked Christ to overcome all divisions so that union "may once again become reality". Finally, the Holy Father recalled Paul's words to Timothy shortly before his heath: "Join with me in suffering for the Gospel". The Pope went on to note that the "duty of announcement and the call to suffer for Christ are inseparable. ... In a world where lies are so powerful, truth is paid with suffering. Those who wish to avoid suffering, to keep it away, keep away life itself and its greatness; they cannot be servants of truth or servants of the faith. ... Where there is nothing worth suffering for, life itself loses value. The Eucharist - the focus of our being Christian - is founded on Jesus' sacrifice for us, it was born of the suffering of love". "It is of this self-giving love that we live. It gives us the courage and the strength to suffer with Christ and for Him in this world, knowing that this is the way our lives become great, and mature, and true".